So I’m thinking that based on emails I get, there are a few questions that get asked over and over for various patterns. Time to put up an FAQ to reference! Today, Just Enough Ruffles! Are you doing the increase correctly? The increase is knit front, back and front again – creating three stitches out of one. You knit into the front of the stitch but don’t remove it, swing the needle around to the back of the stitch and knit through the back loop but don’t remove it, and finally bring the needle back to the front and knit the front loop again. You can add more stitches to the ruffle – I would do the increase row as written, work one row plain, then do another increase row (either tripling or doubling the number of stitches in this row) before working plain. If you have any other questions you’d like to see the answer to, email me! I’m not quite understanding the “warp and turn” technique correctly, is there a more detailed description or video that you can share? thank you. I am with Maggie. Can you video the wrap and turn part of the pattern? It would also be helpful to show the corect way to increase for the beginners! :) Thanks. Hi After I do the wrap and turn do I leave the last two sts. on the left needle or do I knit them? If I’m reading your pattern correctly I do the shape curve short rows then go to the pick up row 1 and 2 however it reads picking up each wrap as you come to it I find this confusing. Do I do a short row and then a pickup for until I have completed the 28 wraps? I’m just starting this project. Are the 2 rows of stockinette stitches included in the first 6 rows? Question tho… After kniting the wrap and turns from the purl side, there is a bit of a ‘bar’ on the knit side. Think I followed the directions correctly-did I do something wrong, or is that the way it looks? Just finished increase row to 600 stitches and am loathe to rip – but want to be sure it’s correct. Have since seen Cat Bordhi’s knit, wrap, conceal. But did not do that, do you get a slightly slated ‘bar’ on the knit side when wrapping and turning? how do I pick up the wraps? I am so confussed!! I’m also wondering about the “wrap & turn” instruction & hoping that you can provide a more detailed description of the technique. Do you have a glossary? Can’t wait to give this to my daughter!! Rhona – there should not be a bar on the RS of the scarf if you pick up the RS side of the wrap as specified in the pattern. Everyone inquiring about short rows – full instructions are given on page 1 of the pattern. As well, there is a photo tutorial in my side bar -> titled “Short Row Heel Tutorial” that covers all the steps. Okay, I have done the increase row, 600 sts on the right side. The next step is the stockinette stitch for 4 rows. So am I knitting on the wrong side now and purling on the right side. I’m confused after the increase row because I have to turn my work over to keep the yarn on the left needle. I am not sure what to do-I am as confused as Kelly who posted on Nov 17. My ruffle is purled on the knit side not on the knit side. PLEASE RESPOND. I am upset to think I have to pull out so many stitches to start over. I’m a newbie and my teacher/mentor is out of town. Am I reading the pattern correctly for the pickups? Should I turn around after picking up the 1st wrapped stitch and the do a purl w/ pickup and then the knit and add the other two left over stitches that are left before the next wrap? I’d normal just go for it…but the thought of making a mistake is freaking me out. I just wish there was a picture of the scarf without the ruffles to see how this works out. Many thanks! Love the scarf so far and see many more in my future. I want to make the ‘Just Enough Ruffles’ in a DK weight cashmere/silk/alpaca. Do I still cast on the same number of stitches and use the same size needle? Thanks; it’s beautiful. I am finishing the scarf and I like it. Question; If I do a total of 28 short rows and then pick up by knitting two together, wouldn’t I end up with 200-38 stitches? not 200 stitches? 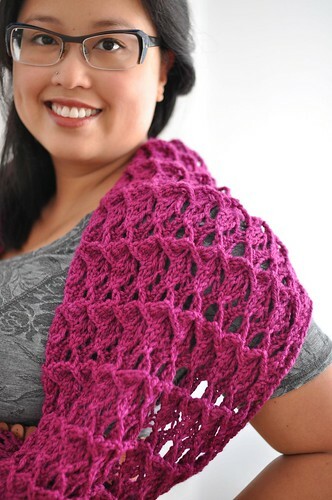 I love the ruffles scarf and think it would be a wonderful feminine wrap. do you have suggestions? Continue wrapping turning & pickup and knit all sides to make the ruffle? Thank you! Where can I get the “just enough ruffles” pattern. I love it! Where can I get the “Just enough ruffles” pattern…Saw the scarf in a yarn shop in Barcelona. I love it. Great scarf! I have the same question as caren. What happens to the 2 unwrapped stitches at the end of each row , if you wrap the 3rd stitch from the end? When counting, is it 14 wrapped stitches PLUS these unwrapped stitches or 14 stitches total unknit at the end of each row? Or am I doing something wrong?